How will this retail personalization buyer's guide help me and my business? A successful e-commerce experience for both site visitor and online businesses depends on relevance. If you connect a visitor with the most relevant products and offers, they will see the value and are more likely to convert. For site owners, higher relevance across many site visitors means increased conversion rates and revenue per visitor. It’s a win-win. Implementing an effective retail personalization strategy can be one of the most cost-beneficial decisions you can make towards increasing your online revenue, improving your online conversion and building a loyal and happy customer base. 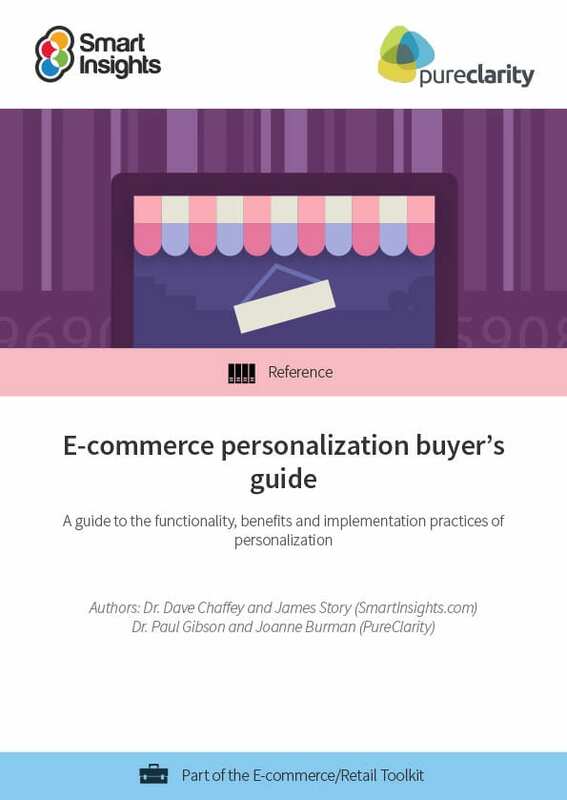 That's why we've worked with PureClarity to create this buyer's guide - so you can learn everything you need to about e-commerce personalization before taking the steps needed to start implementing it in your own company. Who is this buyer’s guide for? How is the buyer’s guide structured? 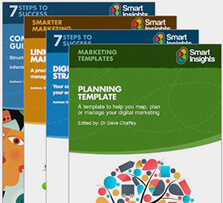 Dr. Dave Chaffey is CEO and co-founder of digital marketing management advice site Smart Insights. He is author of five best-selling books on e-commerce including Digital Marketing: Strategy, Implementation and Practice and was recognized by the Chartered Institute of Marketing in 2004 as one of 50 marketing ‘gurus’ worldwide who have helped shape the future of marketing. In 2015 he was rated as the top influencer on social media for Marketing and Advertising in a top 50 UK compilation by Brand Republic (a portal of publisher Haymarket brands Campaign, Marketing and Media Week). 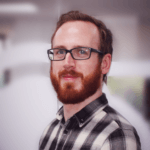 James Story is Content Manager and Data Analyst at Smart Insights, creating and co-ordinating member content across 20 digital marketing toolkits. He is a University of Leeds graduate and has spent the last five years creating content for online PR, SEO and digital marketing activities. Dr. Paul Gibson is the co-founder of PureClarity. He has over 30 years of experience in software development, product development and business management within the manufacturing and retail sectors. 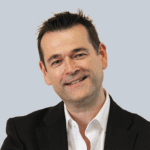 He has led one of the UK’s leading e-commerce agencies for 10 years overseeing its growth. He holds a 1st in Computing Science and a PhD in Artificial Intelligence (AI). His experience of e-commerce and AI technologies led to the inception of PureClarity. Joanne Burman is Digital Marketing Manager at PureClarity and, over the last 12 years, has worked in the E-commerce and Digital Marketing field across several B2C sectors including retail, healthcare and leisure, helping companies devise clear strategies to grow their businesses online. Get this for FREE as a sample of Guides and Templates available in this toolkit. Join as an Individual or Business member and get access to this guide and to a world-beating collection of up to 20 marketing toolkits.